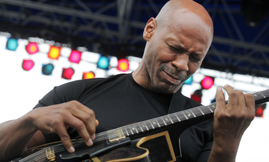 Jazz guitarist Kevin Eubanks was music director for almost two decades for NBC’s the “Tonight Show.” His responsibilities included leading the house band, being an integral part of the comedic stints with host Jay Leno, all while bringing uncompromising quality sound with his guitar. In his new release, Eubanks continues that signature sound, with recordings that mirror his unprecedented talent.Eubanks’ new release, “Zen Food” is a mixture of true “Kevin Eubanks” essence. With such tracks as “The Dancing Sea” and “Spider Monkey Cafe”, Eubanks takes musical liberties that prove to be successful and enchanting. Eubanks will return to the ” Tonight Show” on Tuesday, November 23 to perform; it is also the day his new CD “Zen Food” is released on Mack Avenue Records. Joining him on his new album and return to the show are drummer Marvin “Smitty” Smith and keyboardist Gerry Etkins; they too, are “Tonight Show” alums. With many other tracks offering a rather meditative feel, “Zen Food” seems to be a successful project for Eubanks. Interestingly enough, Z.E.N. Foods is a Los Angeles-based health food delivery service, and receives a special thanks in the liner notes of Eubanks’ release. Kevin Eubanks has been a long time health conscious and nutrition advocate and pays homage to Z.E.N. Foods by calling it “the greatest food in the world.” So one can enjoy the conceptualized double meaning of the title, as his favorite place provides stable and necessary nutrition for the body and his new release providing that same stable and necessary “musical nutrition” for the heart and soul.